The Spokane City Fire Dept. dispatched fire apparatus and their crews to 1227 W. 6th Ave. at 14:46 hrs on Saturday, May 4th for a reported structure fire. 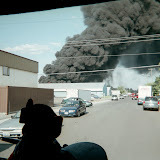 As the crew from Station 4, located in the Browne's Edition section of the City, was approaching the address they could see large amounts of black smoke in the sky and reported by radio that this was a working fire and requested an up-grade to the alarm which would bring additional resources to the incident scene. L4 arrived on the scene and reported a two and a half story wood/frame dwelling with heavy black smoke showing from the roof and eaves of the building and immediately made a decision to make an offensive attack on the fire. As other apparatus began arriving on scene the Incident Commander started making assignments that included water supply, Safety Officer, search and rescue, fire attack, back-up hose lines to protect the fire fighters already engaged in the interior attack, vertical ventilation on the roof, horizontal ventilation at the ground floor level and the deployment of a RIT Team to be in position should the rescue of a lost or injured fire fighter become necessary. A complete search of the entire building was ordered, as per Fire Dept. policy, to ensure that there was no one inside while the simultaneous fire attack and ventilation efforts were undertaken. Fortunately the search found no victims in the building and the very hot and well-advanced fire was brought under control in about 60 minutes. Fire damage to the structure was considerable and much of the interior of the building had to be opened by the fire fighters to ensure that no fire was concealed in the walls, ceilings, and attic space. A large portion of the roof had to be opened to allow the hot, toxic gasses to ventilate into the atmosphere. The areas of the building not damaged by the fire itself were severely damaged by the heavy smoke conditions that were present. Seven engines, two ladders, one Heavy Rescue Truck, and two Command vehicles responded to this incident with 33 fire fighters on scene to get the fire confined and extinguished.